If the predictions hold, this year will be choppy, with more and more fund managers on the Street coming around to the view that the Bombay Stock Exchange's benchmark index, Sensex, will end flat this year, if not in the negative. John Seth says he saw it coming some seven months ago. It was the Independence Day weekend in the US and the New York asset manager saw malls full of shoppers. They were flashing plastic freely and all around there were little signs that the world's largest economy was still hurting from a recession that was the worst in seven decades. Next morning, July 5, 2010, Monday, 41-year-old Seth, who runs portfolios for business family offices and rich individuals, started sending advisories to his clients: with the US economy recovering, it was time to move out money from emerging markets back to developed markets. The chances of the US going into a widely feared double-dip recession were ebbing and from a risk-return perspective, the equity markets there were turning attractive again. Okay, this story is apocryphal and Seth's character is made up but it will find several parallels in the global fund manager fraternity. A community that has, over the past few months, been moving its funds under management from emerging markets, characterised by high inflation, to developed markets which it is more familiar and comfortable with. A call taken in summer 2010 to invest in the US would have been one of perfect timing. That economy grew 2.6 per cent in the July-September quarter, up from a feeble 1.7 per cent in the preceding three months, and ended the December quarter with a 3.5 per cent growth. Since July 5, the US markets, measured by the Standard & Poor's 500 Index, have risen nearly 30 per cent. Reflecting this turn, the Indian bourses have contracted more than one-sixth from a peak in November. Other emerging markets such as Indonesia, Brazil and China (see Spreading Panic) have also lost ground. And, if the predictions hold, the year will be choppy with more and more fund managers on the street coming around to the view that the Bombay Stock Exchange's benchmark index, Sensex, will end flat this year, if not in the negative. "As the US economic recovery takes hold, there is the potential for foreign investor inflows (into India) to slow," says Parul Saini, Executive Director at Singapore-based RBS Asia Securities. Other markets such as Russia, the Gulf countries and Taiwan have attracted investor interest away from India and China on the back of a strengthening commodity cycle, especially for crude oil, and a strong outlook for exports. "Commodity-oriented economies are benefiting," says Toral Munshi, Head of Research at Credit Suisse Wealth Management. Vulnerable is the word to describe Indian markets. In 2011, as on February 9, foreign institutional investors, or FIIs, had sold shares worth $1.45 billion in the secondary market, setting off a 14 per cent fall in the Sensex, in stark contrast to 2010, when the index surged over 17 per cent. "Though domestic institutional investors (only mutual funds) have turned net buyers, we believe markets are likely to fall further if FIIs pull out $4-5 billion," Suresh Mahadevan, an analyst at UBS Securities India, wrote to clients. At least for the immediate term, this trend may not change with developed markets continuing to outperform emerging markets. "The serial correlation of economic revisions," says Hong Kong-based Adrian Mowat, Chief Asian and Emerging Market Equity Strategist at JP Morgan, "argues for a continuation of global cyclical and developed markets' outperformance." Another long-term argument in favour of emerging versus developed market equities has been the strength of inflows into emerging market funds relative to the collapse of flows into developed market funds over the past few years. In the first three quarters of 2010, emerging market equity funds attracted cumulative inflows of $52.4 billion compared to developed market outflows - yes, outflows - of $79.5 billion, shows data from a Citigroup report. In the fourth quarter, however, developed market funds finally began to catch up with inflows of $31.4 billion while emerging market funds continue robustly with inflows of $43.2 billion. "While the volume of long-term flows into emerging market funds has been a significant support for the asset class, there is also evidence of a recent shift in favour of developed market funds, which has coincided with the outperformance of developed markets," wrote Geoffrey Dennis, an Emerging Markets Strategist with Citigroup, in a late January report. It is not just global fund flows that are playing truant with Indian markets. There are worries of a rot internally, too. Blame macro headwinds like high fiscal deficit and stubborn inflation on one side. On the other, there are looming concerns of higher commodity prices and climbing interest rates which will eat into corporate profitability in the coming quarters. Add to this the political flux in New Delhi as a Union government, buffeted by corruption scandals, prepares for a budget session of Parliament that promises to be stormy and it is clear why investors are underweight on India. "The markets may continue to remain weak in the coming months as FIIs could emerge as bigger net sellers in the coming weeks leading up to the Budget," believes UBS's Mahadevan. That is bad news for those stocks singed in the market meltdown. Stocks of Reliance ADAG companies - Reliance Communications and Reliance Capital have almost halved from their recent peak in November 2010 - have been particularly badly battered and even bluechips such as Larsen & Toubro, State Bank of India, Maruti Suzuki and Bajaj Auto have shed more than 20 per cent in value. After the current round of correction, Indian market valuations are close to long-term average of around 15 times one-year forward price-toearnings multiple, or PE, down from around 18 last year. Over the next three to four months, reckons Jyotivardhan Jaipuria, Head of Research, India, at DSP Merrill Lynch, the markets could even dip below the long-term average. 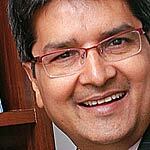 He expects the Sensex to be flat or at best grow 3 to 4 per cent by 2011 end. For Siddhartha Sanyal, Chief India Economist at Barclays Capital, the risk is whether corporate India can meet the earning expectations. "Possibility of earning downgrades is the key risk in this context," he says. "In the event of earning downgrades, if any, equity market valuations will start looking stretched." In this light, a close look at corporate earnings signals looming danger. 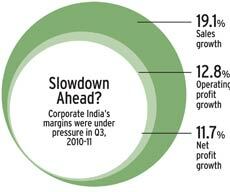 BT analysed 275 companies out of the BSE 500 index that have announced their financial results for the quarter ended December 2010 using data from the Centre for Monitoring Indian Economy. These 275 companies, which do not include banks and oil companies, have reported a year-on-year income growth of 19.1 per cent. But what is worrying is the astronomical growth in the raw material, wages and interest expenses at 20.5 per cent, 22 per cent and 19.9 per cent, respectively. As a result, growth in operating and net profit is 12.8 per cent and 11.7 per cent, respectively - lagging sales growth significantly. 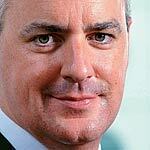 "Margins are already under pressure. Markets are reacting ahead of any derating in earnings," says Harendra Kumar, Head, Institutional Equities and Global Research, Elara Capital, a London-headquartered investment bank. While Kumar expects the Sensex to come down to 15,500-16,000 in the short term, he believes that from the third quarter of the financial year 2011-12, markets will bounce back. UBS, too, sees support at the 15,000-levels for the Sensex even at a lower earnings growth of 12.5 per cent. During 2010, India's valuations were costliest among Brazil, Russia, India and China, or BRIC, economies but investors are suddenly posed with the question as to why India deserves a valuation premium, says Jagannadham Thunuguntla, Head of Equities at New Delhi-based SMC Capital. Further, with investments and industrial output moderating (see India Slowing, BT, February 20 issue), the original hypothesis of the India growth story, too, also faces a big question mark. "The perception of the second fastest growing economy is currently taking a beating," says Raamdeo Agrawal, Joint Managing Director, Motilal Oswal Financial Services. Even so, all is not gloomy out there. Global portfolios are still under invested in emerging markets and India, says offshore fund manager with a domestic mutual fund on condition of anonymity. 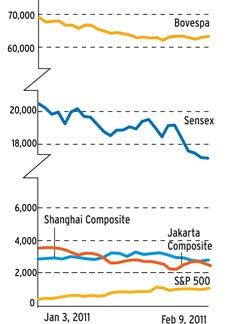 In the current bout of volatility, India has underperformed other emerging markets by around 6 per cent. "This makes long-term investing sensible at the current juncture," he says. There is also a visible shift on the domestic investors' front. Those who were sitting on the fence through 2010 will come in now. "This will help in cushioning the downfall," says Navneet Munot, Chief Investment Officer of SBI Mutual Fund. 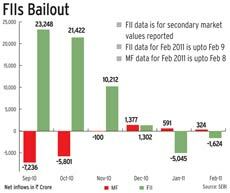 In 2010, mutual funds were net sellers in 10 of the 12 months, registering a net withdrawal of Rs 27,831 crore. Against this, in 2011 up to February 8, mutual funds were net buyers with investment of Rs 915 crore. Credit Suisse's Munshi also expects support from insurance companies in the next two months. That may be balm for mauled bullish investors in India but the writing on the wall is clear: the bears have logged in and will call the shots for some time to come.